It's all about reflected sunlight. The moon’s appearance changes drastically over the course of each month, from a crescent to a half-disk and then a full disk — and then back again. 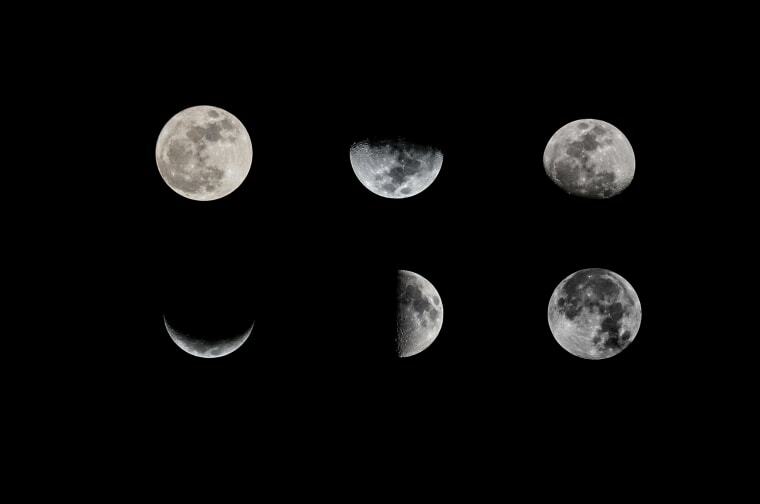 What causes these so-called phases of the moon? Except for those times when the moon falls into Earth’s shadow to cause a lunar eclipse, half of the moon’s surface is always illuminated by sunlight and half is always shadowed. Sometimes the moon presents its full sunlit side toward Earth; at these times, we see a full disk of reflected sunlight, or a full moon. At other times only a portion of the moon’s sunlit side points our way, so we see a sliver of reflected sunlight — a crescent moon or gibbous moon. Sometimes the moon presents only its shadowed face — what we call a new moon — and we can’t see the moon at all. Each lunar month begins with a new moon, followed three or four nights later by a waxing crescent (waxing means getting larger). About seven nights after the new moon, we see half of the moon’s disk — a phase called the first quarter. Then comes a waxing gibbous moon, which is between half-full and full. The full moon appears about two weeks after the new moon. Though the moon looks full for three or four days, in reality it’s full for only a few moments on a specific day. In the second half of a lunar month, the moon starts to wane. First comes a waning gibbous moon, then a last quarter, then a waning crescent — and then back again to a new moon. Eclipses of the sun occur only during a new moon, when the moon passes between Earth and the sun. But because the moon orbits Earth at a different angle than Earth orbits the sun, a new moon brings a solar eclipse only occasionally. In the same way, lunar eclipses occur only during a full moon, when Earth passes between the moon and the sun, But there's no eclipse unless the moon and the sun line up exactly. Human nature and the world around us have often been linked to the phases of the moon. The term “lunatic,” for example, was coined because odd behavior or mental illness was thought to be triggered by the changing moon, Weider says, adding that farmers once believed that fence posts should be set during the new moon; animals should not be weaned during a waning moon; animals slaughtered during a waxing moon give juicier meat; and the best fishing days occur between the new and full moon. Some of the world’s earliest calendars, developed in the ancient Middle East by the Babylonians about 2,500 years ago, were based in part on the moon’s phases. And the moon phases are still used to determine many religious observations. Islamic and Hebrew holidays, for example, are tied to dates in lunar months, says Gordon Johnston, a NASA program executive who has worked on the Lunar Reconnaissance Orbiter. Easter, of course, falls on the first Sunday after the first full moon of spring. WANT MORE STORIES ABOUT THE MOON? Scientists discover water ice on moon's surface. Here's why that's big news.